Kroger has recently announced that it will now be offering its shoppers the opportunity to redeem their SavingStar e-coupons. They can do this by using their Kroger Loyalty Card, also known as Plus Card when paying at checkout. SavingStar is the country’s only paperless coupon service for grocery. Prior to the addition of Kroger, SavingStar already has a number of retailer partners (composed of grocery stores and pharmacies) that offer its customers digital coupons. Currently, SavingStar digital coupons are already being used by more than 24,000 stores all over the country. The main goal of SavingStar is to provide shoppers with a more convenient way of saving money on brand name goods without the hassle of having to clip or print coupons. 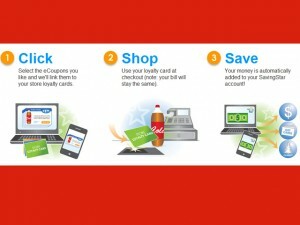 By choosing e-coupon offers on SavingStars website, savingstar.com, consumers can start e-couponing their grocery items. Consumers have to take note though that they must have the SavingStar application installed in their iPhones or Android phones in order to make use of the e-coupons. Currently, SavingStar has e-coupons for brands such as Hidden Valley Ranch, Clorox, Heinz and Welch’s. With SavingStar partnering with Kroger, SavingStar e-coupons can now also be used at 16 grocery chains that are owned, as well as operated by Kroger. These stores include Ralph’s, Smith’s Food and Drug, Fred Meyer, King Soopers and Fry’s. In order to start using the e-coupons, consumers will need to register their loyalty card (like Kroger’s Plus Card) with SavingStar once. Then they can choose the e-coupons that they want. Upon checkout, the money will automatically be saved in their SavingStar account for redemption.